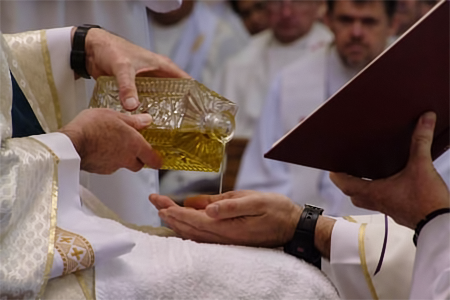 Anointing of hands during the sacrament of ordination. This is the stage before moving into the seminary. The prospective seminarian has a series of interviews with a priest near to where he is currently living. He continues at his job or studies. He does not need to come to Auckland. Accompaniment normally lasts a year. The purpose is to clarify together, or ‘discern,’ what God might be ‘saying’ to this young man. Fr Peter McAfee coordinates this accompaniment stage with several other priests around NZ. The new seminarian moves in to Marist Seminary. He goes to classes Mon-Fri at Good Shepherd College which is nearby. Meals, study, Mass, prayer, exercise, and socialising are all part of the seminary day and community life. It is a full time program. From this first stage he lives as a member of the religious order. Therefore he does not use his own savings. Instead he depends on the Marist community, which covers his costs. The studies at this stage, are geared towards a Bachelor of Theology with a philosophy major. He lives at Marist Seminary for 2.5 years. However, during this period, a year away at Novitiate is inserted. This comes at the end of the first year or the end of the second year. This stage is a spiritual year. It is held in the Philippines. There is a strong emphasis on community living. There are some classes but no exams. There are several retreats during the year. The focus is on becoming a man of God and a Marist. There is a good deal of silence, outside work and times for prayer. The students doing their novitiate come together from all over the world. They get to know each other well. English is the language used. Back at Marist Seminary in Auckland, the NZ seminarian finishes his philosophy major and possibly a Bachelor of Theology. He completes his 2.5 years of studies in New Zealand. 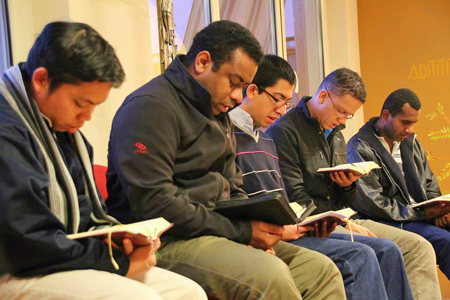 Marist seminarians from around the world travel to Rome to study theology. Here, they gather in prayer in the Theologiate Chapel. The seminarian goes to Rome for four years to complete his theology studies and pastoral learning (i.e. the more practical skills). The Society of Mary has a seminary there for Marist students from many different countries. Family are most welcome to visit him in Rome. The student returns to New Zealand and joins a working Marist community (school, youth work, parish, mission etc). He is a full-time worker putting his new skills and studies into practice. When he is ready, he takes perpetual vows and is made a deacon. After about a year as a deacon, he is ordained a priest. This ends his time in training. The priestly ordination Mass normally takes place in his home parish.